Anyway, lots to do.. I still have to get the mouse video done then this elephant will be next. I have an update for the Tiny Dress. This dress fits the elephant (pictured), the mouse and the pig. sleeves and it made the sleeves look that much better. when you pull the yarn through to start the sleeve, in the same space that you pulled the yarn through add 1hdc then carry on as the video instructs. Not a big deal but I wanted to pass that along. The sleeves are in the video (near the end) but not in the written pattern. Happy day to all, see you soon! the updates aree really cute!thank you! 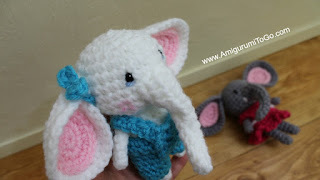 I love everything you create, but I think this little elephant wins the prize for the cutest ever...at least in my book! aww thanks!! I think she's my favorite so far.. I really love her, so glad you do too! Your elephant is so cute. Lovely design.